OGDENSBURG -- The Frederic Remington Art Museum recently received an estate gift of $212,000 from Lee and Deborah Hirschey. The Hirscheys “have been great proponents of the Frederic Remington Art Museum and its mission for many years,” the museum said in a press release. The former president and chief executive officer of Climax Manufacturing Company in Lowville, Lee Hirschey died in May. He had been a trustee of the museum and a contributor to its finance committee. Charter members of the museum’s William R. Clark Legacy Society, which recognizes planned gift donors, the Hirscheys were regular annual gift donors and helped with leadership gifts for specific projects like the museum’s 2018 HVAC renovation. 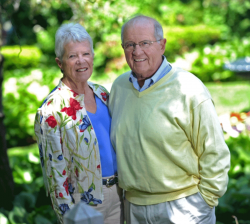 “We are so pleased and grateful to the Hirscheys for their generosity and foresight in creating a new permanent fund at the Northern New York Community Foundation, income from which will directly benefit the museum,” Laura A. Foster, museum director, said in a prepared statement. “Lee used to say he felt that the Remington Museum was a place where charitable donations really make a difference,” she said. The Frederic Remington Art Museum, 303 Washington St., “expands and deepens appreciation and understanding of Remington’s work by engaging contemporary audiences and keeping his legacy relevant,” the release said. It is dedicated to collecting, exhibiting, preserving and interpreting the art and archives of Frederic Remington, and contains an unmatched collection of his works. The museum is open Oct. 15 through May 15, Wednesday through Saturday, 11 a.m. to 5 p.m. and Sunday, 1 to 5 p.m., and May 16 through Oct. 14, Monday through Saturday, 10 a.m. to 5 p.m. and Sunday, 1 to 5 p.m.